Maxwell likes learning. He loves learning about the country that he lives in and he loves learning about the world around him. He adores finding out where other people live, how they live and what is different to their country from ours. Recently Maxwell and I were sent a SmartGlobe Adventure to review. Maxwell enjoys learning about the world so this was a very special item to be sent. Maxwell and I received our new SmartGlobe Adventure and we were thrilled to find that we were able to use it straight away. There was minimal packaging and the globe itself came with batteries in it already which meant we were able to play with the globe without having to fuss with taking battery backs off the toy and inserting batteries into the globe for it to be able to work. This was a huge plus for me as I hate faffing around trying to power up toys before we are able to use them. Once unpackaged, we were ready to use the globe. The globe spins on an axis which enables the globe to move with ease and allows it to spin quickly. The globe comes with a special electronic pen. The electronic pen is connected to the globe which is a great feature as this ensures that the electronic pen is not able to get lost. 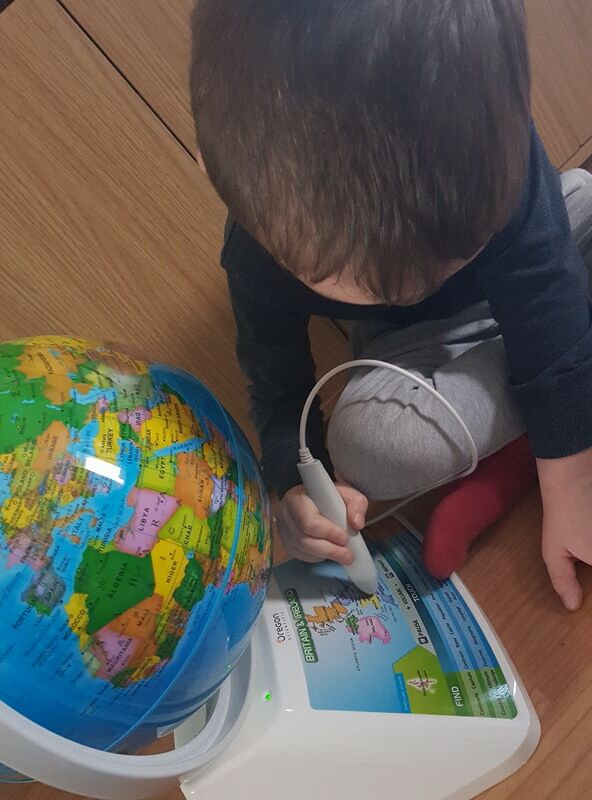 The electronic pen which is connected to the SmartGlobe is easy to use. You simply use the pen to point and touch one of the 25 games that are located on the SmartGlobe's stand, you then touch a country with your pen to either play a game or find out facts about the country you have picked with your pen. Maxwell adored finding information out about the United Kingdom but he also loved finding information out about places such as America, Australia and China. The globe is detailed and bright in colour which is very appealing to children playing with the globe. There are a wide range of topics to learn about and lots of games to complete which makes learning fun! The globe is not a toy which is picked up and put down. The globe is a toy which gets hours of use in our house and is a toy which will continue to get hours of use as Maxwell grows. I feel that the globe will go on to help Maxwell complete his homework as he grows older. With activities that allow Maxwell to learn currencies, population, history and geography, the SmartGlobe Adventure AR toy guarantees to give its user a whole load of wisdom. The SmartGlobe Adventure AR features augmented reality. This allows the user to download a dedicated app which works with the globe from the Apple or Google play store. Once the app is downloaded anyone who uses the SmartGlobe whilst on the app will be able to see landscapes, animals, landmarks and even dinosaurs. This feature is amazing and it is something which Maxwell loved. The AR feature really makes this globe different to many others. The globe is a good size however it is a size which makes it easy to pack away if you are looking to do this. Personally we recently transformed Maxwell's bedroom into a space themed room so we feel that the globe makes a fantastic feature. 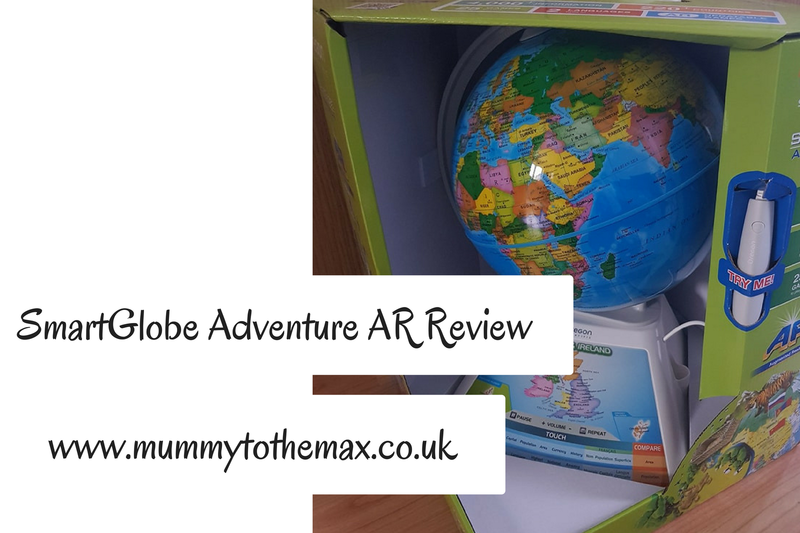 Maxwell and I love the SmartGlobe Adventure AR and we would opt into buying this globe over a globe which has no interactive features. The SmartGlobe Adventure AR is a toy which is educational and fun. I feel Maxwell will get a lot of use out of it so I feel that the price is fairly cheap considering all the features that the globe comes with. Overall this toy gets a massive thumbs up from us.